After Office 2016 16.0.6741.2014 (or higher) is installed, users will see an Archive button on the home ribbon, next to Delete. 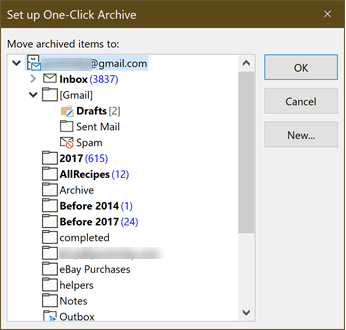 Not to be confused with the old Archive function, which is now called Clean Up Old Items, or AutoArchive, this Archive button is an extension of the Archive button in Outlook.com and Outlook on the web, moving selected messages into a single folder. If you use Archive in Outlook for iOS or Android, Outlook will automatically use the same folder. Archive works with POP3 and IMAP accounts too. Yes, Quick Steps does the same thing, but Archive has a better shortcut key: Backspace. Everyone who uses the Delete key to file their mail can now use the Backspace key to file and Delete to delete the junk they don't need to keep. Using it is simple: select a message, click the Archive button to move the message to the designated folder. Keyboarders will use the Backspace key to move to the archive folder. I'm apparently one of the few people who like the new Archive button, everyone else wants to remove it from the ribbon. Because it's in a default group you can't remove just the Archive button, but you can remove the Delete group and create a new group containing all of the commands, minus the Archive button. Click New Group to add a new group just below the Delete group then rename it. Remove the default Delete group. You'll also need to remove the Delete group from the Message ribbon and create a new group minus Archive. Can you remove the button by adding the command ID to the registry? No. You can disable the button (command id is 26308) by adding it to the disabledcmdbaritemslist key, but unfortunately, it doesn't remove the button from the ribbon. The button is grayed out but visible. Warning! If you have other commands disabled using policy, do not use this registry key. It will replace the command disabled in TCID1. Edit the registry yourself, incrementing TCID to the next available number. To disable Backspace keyboard shortcut, you need to use group policy or add the policy key to the registry. Note that this will disable the backspace key everywhere in Outlook, however, it will work when you are actively typing. To enable backspace any Outlook item, simply type a character or space at the end of the text you want to delete to turn Backspace on temporarily. Or use Shift+Backspace (or Ctrl+Backspace to delete whole words). Note: if you have other keyboard shortcuts disabled, the number in KeyMod needs to be the next available. Warning! If you have other keyboard shortcuts disabled using policy, do not use this registry key. It will replace the value used for KeyMod1. Use Backspace button: Where it says: Archive to options: "Select NEW FOLDER"
For the New Folder: Go into "GMAIL" --> Then Go to TRASH --> "Add NewFolder, and do a name"
--> Likely reason: It cannot push it into Gmail's trash directory? For now, I just found an ALTERNATIVE, after HATING the Archive to be a backspace button. >> --> Likely reason: It cannot push it into Gmail's trash directory? Possibly. I'll see if i can repro. Do you see the Trash folder when you select a new archive folder? It's not visible here. Does the Archive button only appear for click to run installs utilizing Office 365 or does this also apply to .msi installations utilizing on-prem Exchange as well? It's only click to run right now - the msi installs are several builds behind the click to run builds. Use Auto Archive options to set a default archive status per folder then manually edit any folders you don't want archived, or want archives more or less frequently (such as calendar). In Options, Advanced, open the auto archive options. Tick to enable archiving then choose the default time span, click the Apply to all folders button then untick autoarchive. The only issue will be it only applies to the default data file... a macro might be easier. The option to include items with do not archive applies to items specifically set to do not archive, not folders. If you choose the clean up old items option to use autoarchive settings, it would apply as it is an auto archive setting. Thanks, appears complicated many places to go......Based on what you saying Auto Archive sets a global rule (File - Options- Advanced - AutoArchive-) selects where to move emails to & only allows one Archive File for entire Outlook. I have a personal Archive.pst & Business Archive & appears no way to set up each of these on own Archive File....Also Auto Archive will not allow me in July, for instance....Archive everything prior to December 31, 2017 to start new 2018 archive files (pst for business & personal)....Only way it appears is to reset the global for entire outlook & reset each folder within "data file" either personal or business for different Archive file (ie 2017 Archive Personal). A lot of manual effort I sometimes 300 - 400 emails daily in my business......Are my assumptions correct??? >> only allows one Archive File for entire Outlook. The default setting using one file, but you can edit individual folders to use a different one. (I have a few clients that do this). Setting it up is a pita though, unless you use a macro to set the archive properties per folder. I went back and right clicked a folder and went to properties and it has a button that says "Do not Archive Items in this folder", why is this button that says "Do not Archive Items in this folder" there if you can only auto archive items by individual items and not by entire folders that should not be archived when the auto archive runs??? That applies to all items in the folder when you use autoarchive, but when you use the manual archive (not called clean up old items), not autoarchive, the option to 'include items with do not archive set' applies to individual items, not the folder's global props. If you archive based on autoarchive settings, it would honor the folder properties. in outlook 2013/2016, open a message then click the expander icon in the Tags group to bring up the Properties dialog. If you mark a message to do not archive, the option in clean up old items to include/exclude items marked do not archive would apply to this message. Is it possible that this Update is available only for "click-to-run" installations? On my professional plus 2016 MSI Version with all Updates installed I do not see this button..
What build do you have? You definitely need to have an updated build, but they also limit some new features to subscriptions. Currently I'm on version 17 of Outlook and I do not have this option: File menu. Click Tools then Set Archive Folder. My goal in using this option was to set the archive folder as deleted items. Was this possible in earlier version's? Historically didn't the backspace key always send email messages to the deleted items folder? They removed the ability to set the Archive folder from newer builds of Outlook. Their plan is to always use the Archive folder - unless they get a lot of negative feedback about it (on Outlook.uservoice.com). The option is still in build 8229.2103/Current channel. No, backspace was not assigned to a shortcut before - it was just backspace. Delete key was the only one that deleted. I love the archive button! But I do not want it to let me archive sent items - I want my sent items to be in my sent folder. I view messages in conversation mode, and after I send responses I tend to archive the whole conversation. Then when I go to sent items to view the most recent sent message, the only one in there is the very first originating sent message. It is disconcerting to not see it where I expect it to be and to have different messages in the same conversation in different places. Is there a way to either prevent it from letting me archive my sent messages, or at least to keep a copy in the sent folder? Is there a way to get rid of the damn "Archive" menu item off the right click menu? I've used Outlook for something like 18 years, and I'm pretty used to right click, barely slide the mouse, and click to delete a message. I've archived so much crap, that I now have to go into my archive folder (which is below all my inbox folders), and delete out of there. Microsoft does this to me all the time you'd think I'd expect it. Might be time to move back to 2013, which worked correctly and probably will for a few more years until they discontinue support for it with O365 (which they plan to do in a year or two). At this time, no. A future build may support a reg key to disable it and remove the commands. I would like to disable the function of the backspace button archiving items. The problem is that I keep a lot of notes in my contacts. If i forget to hit the edit link (which was not necessary in my previous version) and instead highlight the text i want to change, when I hit backspace my contact disappears. How can I disable that function? OMG... it's working. Not sure which is correct, because i used 08, 8, and 0x08, (will need to start deleting the keys and restarting outlook :)) - the secret is to add a comma after the number. Oh, and since it's in the policy path, you need to restart Outlook. >> If i forget to hit the edit link (which was not necessary in my previous version) and instead highlight the text i want to change, when I hit backspace my contact disappears. I got to thinking (always dangerous!) - you shouldn't be able to archive contacts, so backspace in contacts shouldn't do anything. You shouldn't need to click on edit either. Are you using Outlook desktop (windows or mac) or Outlook on the web?